Nobody ever expects to be involved in a serious car accident, but it happens every day. If and when you are involved in an accident, it can be very difficult to deal with the insurance companies. In the midst of a serious injury, you may find yourself being accused by another driver when the accident was not your fault. You might find yourself being bombarded with questions about the weather, the number of vehicles involved, and what actually happened right before the accident occurred. If you are seriously injured and in a vulnerable state, answering these questions can be quite overwhelming. In addition, insurance companies can attempt to use your answers against you in an attempt to deny your claim. Because of this, we recommend enlisting the help of a Texas car wreck injury attorney to protect your rights. 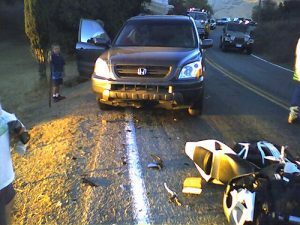 Here is a list of things you should do if you become involved in a car accident. Before you speak with an insurance company, contact Parker Law Firm. Gather Information. Obviously, if you are injured in any way, seek medical attention first and foremost. If you are able to leave the scene, don’t do so until the police arrive to document the details of the wreck. Make sure names, addresses, phone numbers, vehicle information and insurance information of all parties involved is obtained. Do not tell anybody about your suspected injuries until you have received medical attention. Give only the facts. Give basic information to the police officer and don’t talk to anybody else about the accident until you speak with a Parker Law Firm attorney. Gather Evidence at the scene. If you are able, snap pictures of anything on the scene that may be of importance: skid marks, the positioning of cars, damage to your vehicle, yourself or anything else that may be of the question down the road. Do not give a statement to the insurance company. Always speak to your attorney first. The main agenda for the insurance company is to find a way to deny your claim. If a claim is made against you, refer it to your Parker Law Firm attorney, along with any paperwork you have received from all parties involved in the accident. Seek an attorney’s advice regarding a claim made by you. Only then can you be assured you are receiving just compensation for your injuries, lost wages, property, pain, and suffering, and possible future treatment you may need. The attorneys at Parker Law Firm have 25 years of experience dealing with insurance companies. We know that their top priority is to save money by avoiding the payment of your claim. Our top priority is to protect our clients. Insurance companies have extremely clever ways of avoiding paying the claims of accident victims but we are a step ahead of them. If you have been seriously injured in a motorcycle or automobile accident that was not your fault, allow us to take care of the details while you focus on recovering. Call the Parker Law Firm at 817.440.3888 for a free case consultation today.